When will the Fed hike interest rates again? Janet Yellen is getting closer to raising interest rates. The Chair of the Federal Reserve signaled that a rate hike this year is still on the table. "I believe the case for an increase in the federal funds rate has strengthened in recent months," Yellen said in a speech in Jackson, Wyoming. But Yellen was vague on timing. The Fed's committee next meets in late September. It also has a meeting in early November, however, it's unlikely the Fed would raise rates right before the U.S. elections. Plus, such ambiguity from Yellen may indicate that the Fed will wait until its meeting in December to raise rates. After all, Yellen said in May that a rate increase would be appropriate over the summer months. She then changed course when the May jobs report was shockingly weak. Now she's giving no time reference. But the job market bounced back in June and July, adding over a half million jobs in the that period. Yellen highlighted the job market's improvement and "solid growth" in consumer spending. Experts agree. "The consumer is actually doing pretty good and there are elements of the labor market doing better," says Phil Orlando, senior portfolio manager at Federated Investors in New York. Orlando believes the Fed is likely to hike next in December. Related: The U.S. economy's biggest problem: the smartphone? She spent much of her speech on the Fed's tools that it has used to respond to the Great Recession. The Fed put interest rates at zero in December 2008. Low interest rates made it easier for businesses to borrow money and hire new workers. But low rates were also a key reason behind the stock market's strong rally over the last seven years. Since investors earn very little interest on safe investments like U.S. treasury bonds, the Fed's policy may have caused investors to take more aggressive risks. Yellen said if future Fed leaders kept rates near zero "they might inadvertently encourage excessive risk-taking and so undermine financial stability." Stocks didn't react much to Yellen's comments on Friday. The Dow and S&P 500 remained slightly positive. Even though economic growth has only averaged about 1% this year, Yellen sees the glass half full. "While economic growth has not been rapid, it has been sufficient to generate further improvement in the labor market," she said. The Fed raised interest rates last December for the first time in nearly a decade. At the beginning of the year, the Fed projected it would raise rates four times this year. But falling oil prices, China's slowdown, rocky stock markets and the United Kingdom's vote to leave the European Union -- Brexit -- forced the Fed to revise its plans, not to mention warning signs like the May jobs report. Currently, the Fed projects it will raise rates twice this year, though Fed officials have only been talking about one increase in recent weeks. 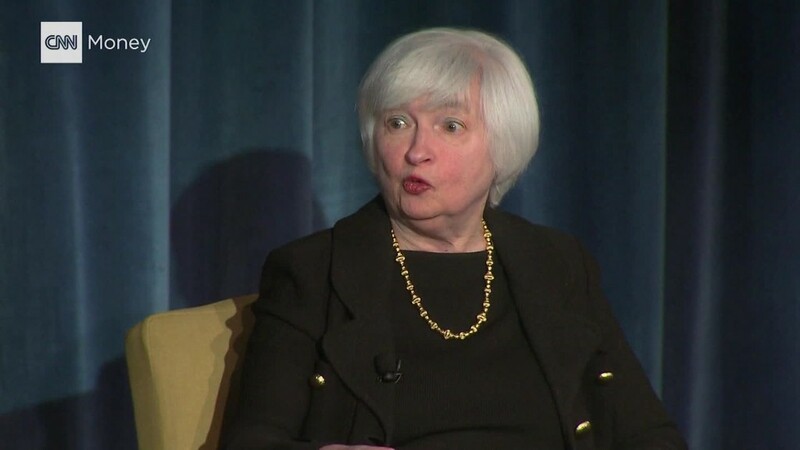 Some say Yellen gave enough hints about a rate hike without showing all her cards on Friday. "Yellen succeeded in leaving the door open to almost anything," says Kathy Jones, chief fixed income strategist at Charles Schwab. "Unless there's a huge rise in jobs in the next jobs report, [a rate hike is] still probably more likely in December than September."